New York State Assembly Member Alicia Hyndman is pleased to welcome the Mobile Legal Help Center to her office. 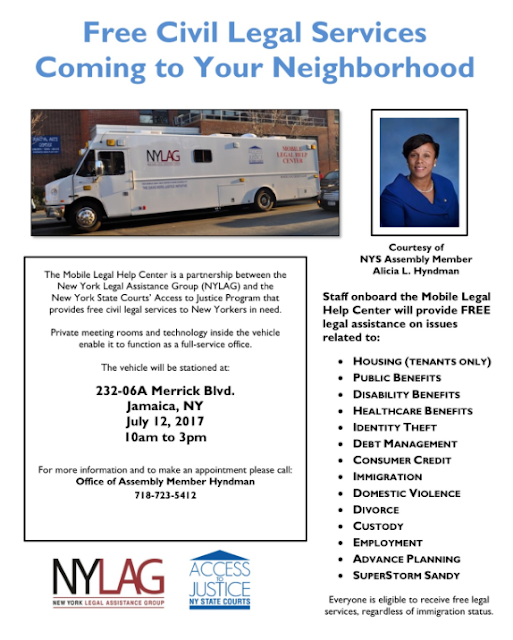 Staff onboard the Mobile Legal Help Center will provide free legal assistance on issues related to: housing, public benefits, healthcare benefits, identity theft, debt management, consumer credit, immigration, domestic violence, divorce, custody, employment, advance planning and SuperStorm Sandy. Everyone is eligible, regardless of immigration status. Labels: Free Civil Legal Services coming to your neighbor hood.